Amami Ooshima Tsumugi Sightseeing Garden where you can learn and experience the processes how the Ooshima Tsumugi is produced from the white silk thread. 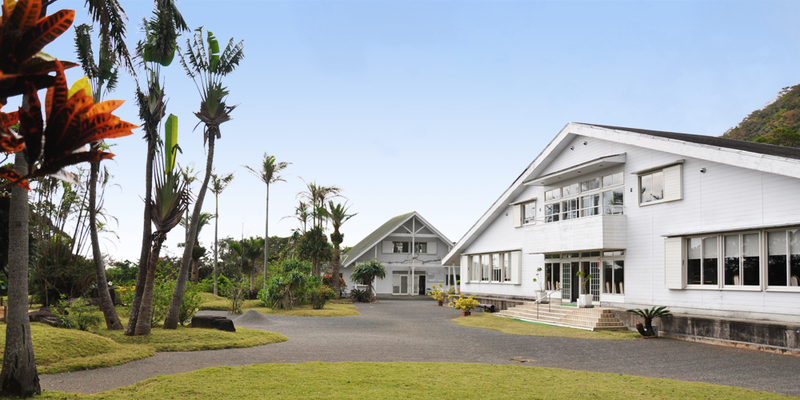 Ooshima Tsumugimura is a natural garden surrounded by subtropical vegetation where you can learn and experience the processes how Ooshima tsumugi is produced from white silk thread. 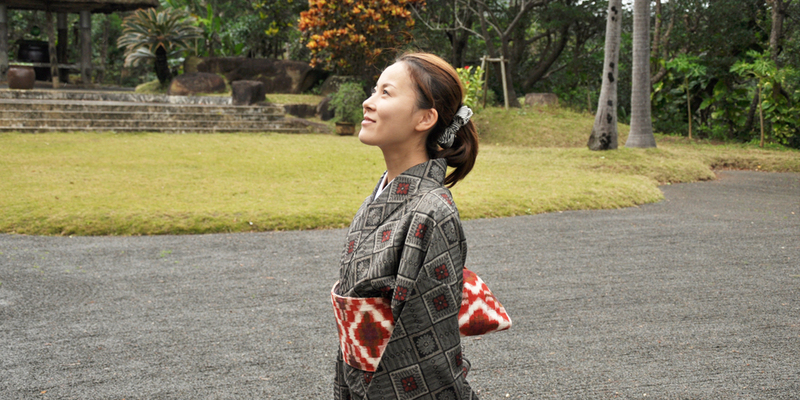 Amami Ooshima tsumugi is the high-class silk pongee which symbolizes Amamian history, pride and folklore culture from ancient times, since 1300 years ago. It is made by a unique dyeing method using mud. Natural mud-dyed Ooshima tsumugi gathers the eternal admiration of all japanese women for its sumptuous shine, touch and rustles on the skin. The pongee of Ooshima tsumugimura has noble dignity, represents traditional artisan skills of a kimono, which will continue to shine and transmit as a cultural inheritance. In addition to the exhibition and sale of Oshima Tsumugi, We offer products such as small gifts and souvenirs that take advantage of the Oshima Tsumugi. 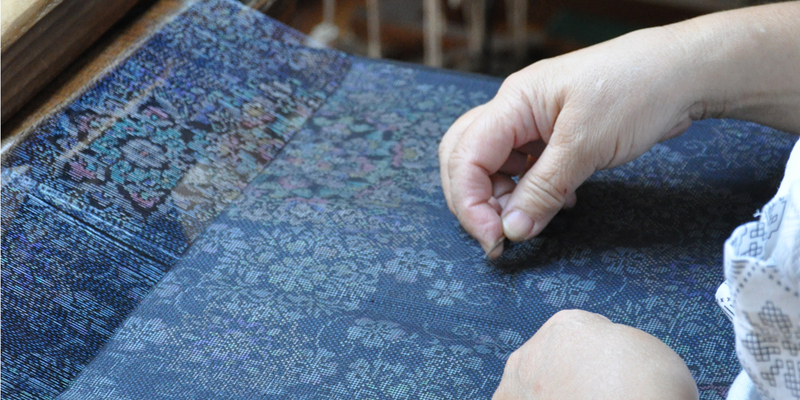 The process of shimebata is th most important role in making Ooshima Tsumjgi to make patterns on silk threads. 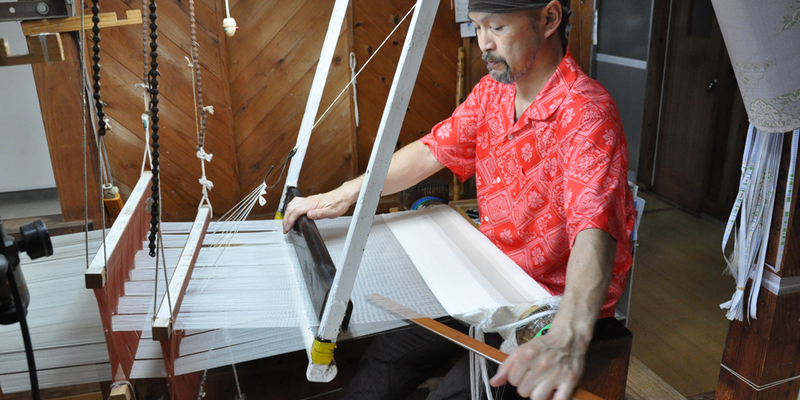 Craftsmen fold silk threads with cotton threads tightly to make "kasurimushiro" by shimebata loom. Sharinbai tree is used as a dye for Ooshima Tsumugi. The dye of Sharinbai is enriched with tannin. Silk threads and Kasurimushiro are dyed about 80 times with this dye. 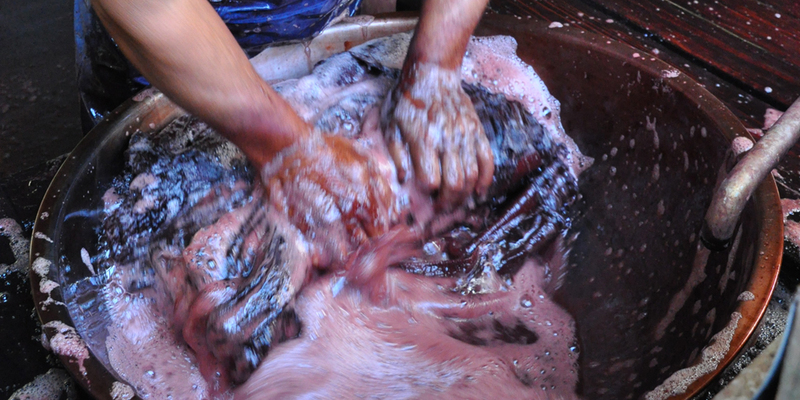 One of the unique process in making Ooshima Tsumugi is mud dyeing. 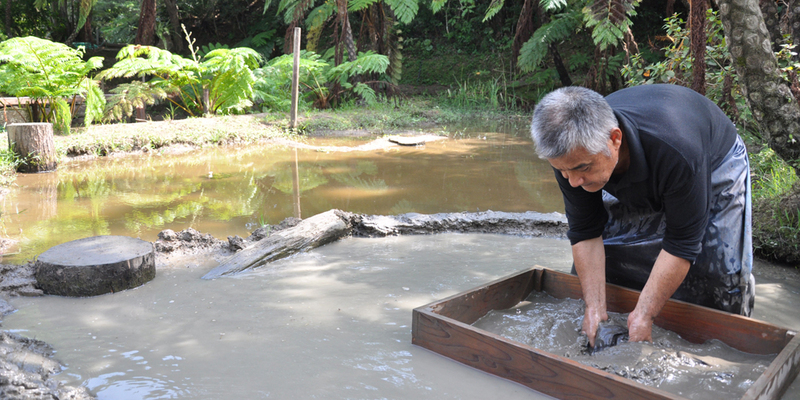 The mud fields in Amami Ooshima contain a lot of iron. Shiny black silk threads are produced by the mud fields due to the iron and the tannin in sharinbai. Ooshima Tsumugi carries the world's most finest pattern. The main reason of this is because vertical threads and holizontal threads are woven matually. 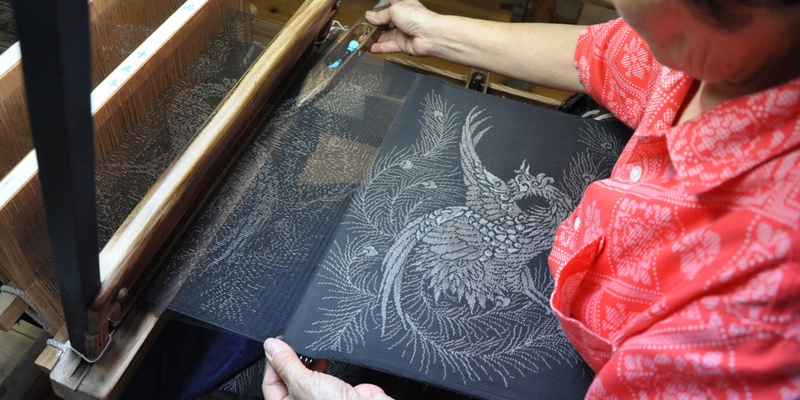 Weavers can only weave 30cm a day and takes about two months to make one roll of Ooshima Tsumugi. 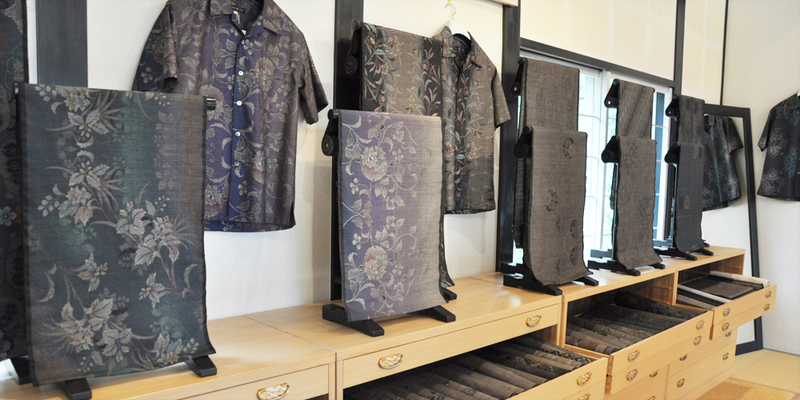 Ooshima Tsumugi is admired and loved by Japanese women for its confortable wearing and process of Ooshima tsumugi. You can learn and experience the processes how the Ooshima Tsumugi is produced from white silk threads. During the tour, you can also enjoy the subtropical nature garden surrounded by flowers such as bougainvillea and hibiscus. Natural monuments inhabit around this garden such as Lidth's jay　and White-backed Woodpecker. Experience how Ooshima Tsumugi is made by creating your original mud-dyed t-shirt, hand-weaving using a loom, and for trying on an Ooshima Tsumugi. We offer you to the best quality and valuable Ooshima Tsumugi that our skillful craftsmen made. We also offer products such as gifts and souvenirs that take advantage of the Oshima Tsumugi.